Given my recent conversion to triathlon, the first order of business was to get the fit on my tri bike dialed in. In road racing, you’re generally not on your time trial bike for very long, almost never are you on it for more than an hour and 90% of the time, it’s less than 30 minutes. As such, you can ride the most aggressive and uncomfortable position that man has ever seen. On the other hand, in a triathlon, especially during Olympic distance racing and farther, not only are you on your bike for an hour or more, but you also have to worry about running afterwards. 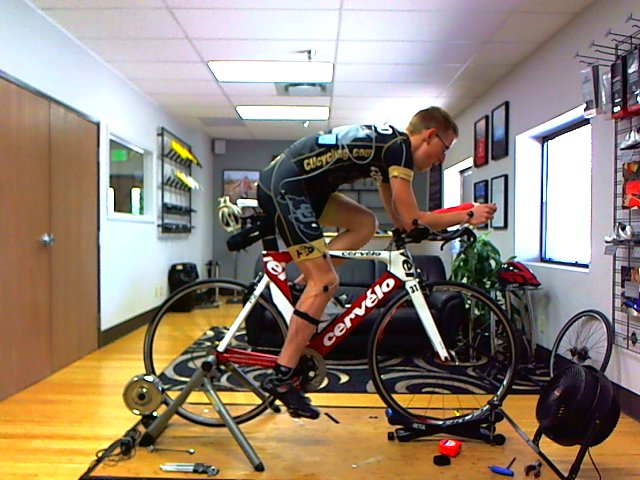 This necessitates a different position and I enlisted the best to help me, Mat Steinmetz at Retul. 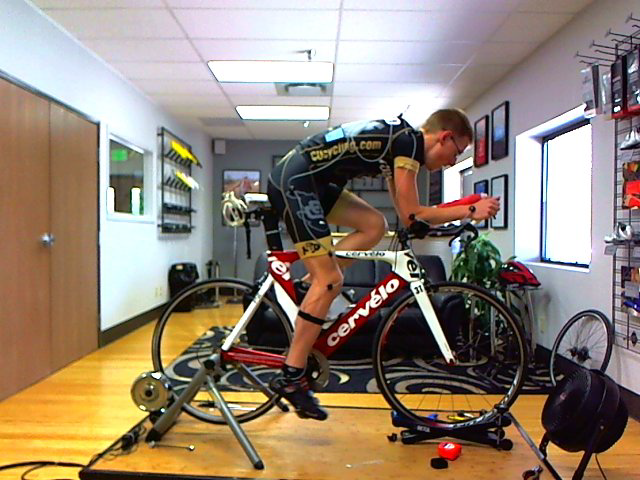 For anyone unfamiliar with the Retul fit system, they place markers on your body that are read by a light system. These markers track your movements in real time, so your fitter can see *exactly* what your body is doing in motion. Traditional fits rely on a fitters ability to see what’s going on and judge for themselves what your various angles are. With Retul, there is no guess work and your fitter can worry more about what to do with your body and less about whether your knees are actually in line or if they are just “close”. The fits are expensive, if you don’t have any sponsor support, but they are totally worth it, especially if you can get one from a guy like Mat, who has worked with just about every major professional triathlete and cyclist in the world (Schleck brothers, Tom Danielson, Craig Alexander, Mirinda Carfrae, etc). Needless to say, my fit changed dramatically. Not only did my saddle come up over 20mm (which is significant), but my front end was also brought up by a similar amount; opening up my hip angle by several degrees. Counter-intuitively, this also had the effect of lowering my front end as well. My elbows were also brought inwards several millimeters. In layman’s terms, I’m more comfortable, more aerodynamic and able to produce more power. Sadly, there’s no way to prove how many watts you gain or lose during a fit, but I bet it’s going to be quite a few!